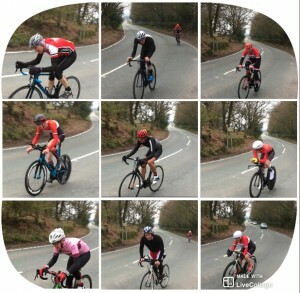 The first evening TT promotion was the 9.2 mile hilly, (over 1000 ft of climbing), around The Cloud from Bosley, took place on April 16th. 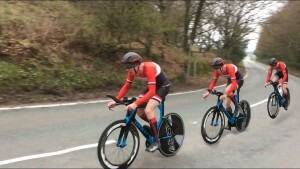 Ben Norbury was quickest in 23 minutes and 23 seconds on his TT bike. Jake Dooley was second in 24:59 on a road bike followed by another TT bike ridden by Philip Gleave in 25:03. Lucy Rogers was fastest lady in 32:29 ahead of Lesley Norbury. There was a cold wind which was behind the riders on the 3 mile dash to the finish. The roads were dry following earlier rain. FULL RESULT HERE Note. This year we have added a road bike competition. Road bikes are shown in results as RB, Time Trial Bikes as TT.